Did you ever want to learn more about the art of blacksmithing? One of Montgomery's own offers to show his craft. Roger Heyda stated, "It's more than pounding iron! It's interesting how much you can make out of iron without using electrical power and any modern equipment." 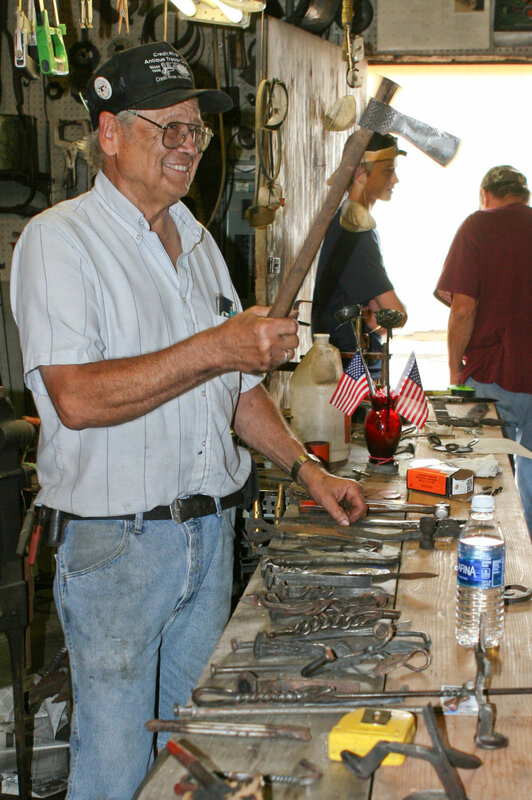 Heyda began blacksmithing as a hobby about 15 years ago. During the demonstration, he offers a little history on blacksmithing and shows how different things are made with tools of the time. He uses a coal forge to heat the metal and hammer it out on an anvil. Located right off of 1st Street by the Antique Tractor Show. The Blacksmithing Shop is open on Saturday from 11:00 a.m. until 2 or 3:00 p.m.
For more information, please contact Roger Heyda at (612) 756-0335. Museums bring history alive. The Blacksmithing Museum located on the south end of Montgomery's business district is no different. Here one can learn about how one early pioneer of Montgomery made a living in a small farming community. The Blacksmithing Museum was built as a unique tribute to a local man's father and his hard work through the years. 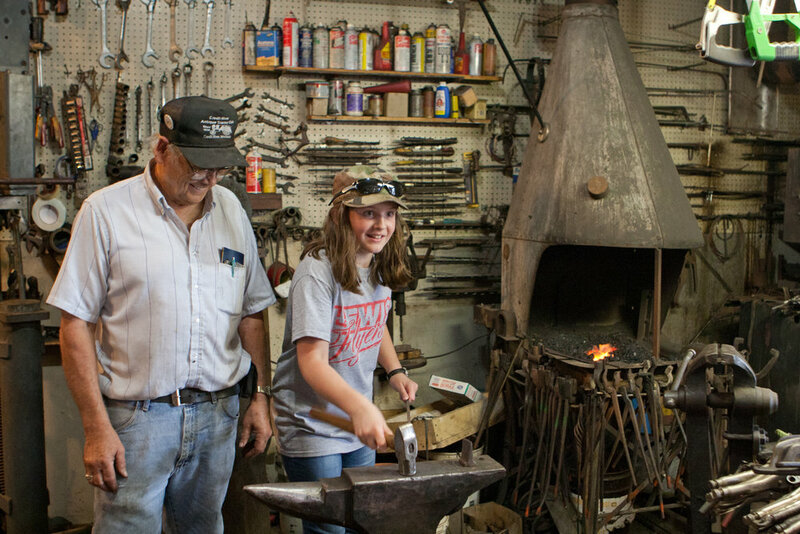 Clarence and Dorothy Hruby built this scaled down version of the original blacksmith shop where his father, Joe Hruby, the 1968 Kolacky Day Grand Marshal, began his work as a blacksmith in 1918. Most of the tools and equipment in the current blacksmith shop are items that are from the original shop where Hruby shoed horses, made wagon wheels, and repaired machinery and tools. At his prime, Joe could sharpen 50 to 75 plow shares a day. Come capture a glimpse of Montgomery's proud past! For more information, please contact Clarence Hruby at (507) 364-7658.